Oh what a celebration! 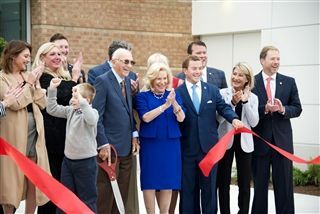 The Boll Campus Center opens! More than 400 alumni, friends, families, faculty and staff and VIPs were on hand Sunday, Sept. 9 and Monday, Sept. 10 for a series of grand opening celebrations at the John and Marlene Boll Campus Center. John and Marlene Boll and many of their family members were in attendance at the VIP reception, including daughter Kristine Boll Mestdagh, who addressed those in attendance. Board of Trustees President David Nicholson; Board of Trustees President Emeritus John Stroh ‘78, Class of 2019 student and student commission President Billy Kopicki; Kelley Hamilton, associate head of school for external relations and Grosse Pointe Memorial Church Pastor Peter Henry also provided remarks during the event. The family picnic, which followed the VIP reception, was attended by more than 250 families and faculty and staff. The Fruehauf Gymnasium was open to students who played games of pick-up basketball, jumped rope or played in one of the two bounce houses. Attendees at all three events, including at the Alumni Open House, were delighted to treat themselves to self-guided tours through the new 30,200 square-foot-facility, with many marveling at the modern touches and the spacious, bright facility. The John and Marlene Boll Campus Center was named in honor of local residents John and Marlene Boll, of the John A. and Marlene L. Boll Foundation, who made the lead gift of $4.25 million to Liggett’s Sure Foundations campaign. The $50 million Sure Foundations campaign invests in the school’s campus, builds its endowment and raises funds for operational support to students and staff. To date the campaign has raised $37.5 million of the $50 million goal. Groundbreaking and construction began on the Boll Campus Center in September 2017.